After arriving at the Little Governors airstrip we were met by our friends Dave and Lucie who took us to their house at Main Governors camp first before settling us in to our tent at Little Governors. Although nominally it is a tent, canvas, poles and guy ropes - inside it had a wooden floor in the bedroom area and a tiled floor in the en suite bathroom - 5 star luxury. The camp has no fences so the animals are free to roam. At night we were escorted from the bar and dinning area to our tent by an askari (armed body guard) to protect us from any wandering animals. Once safely in our tent we could the sounds of hippos and giraffes grazing outside and although we never saw them very close to the tents their were large footprints on the paths. 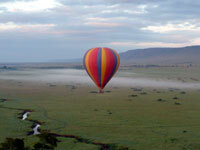 Our first morning and we were so fortunate to get a balloon flight alongside 2 other balloons. It did mean getting up at 04:45 but it was well worth it. 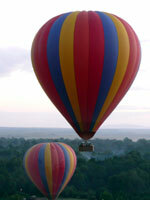 As experienced balloonists the excitement wasn't so much in the flying as the scenery. 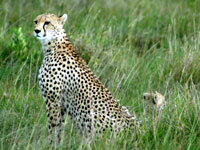 The Masai Mara is truly beautiful with very expansive horizons. 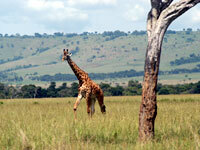 On one side is the savannah and on the other an escarpment with the Mara river meandering between the two. We flew out from the camp and within a short distance we were seeing a whole range of animals, not in large numbers but always exciting to see lions, elephants, etc from the air. 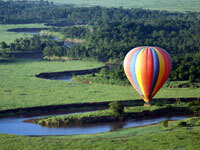 The Mara river is very meandering with a number of ox bow lakes all the way along its length. It is the home of hippopotamus and crocodiles neither of which are very friendly and so a quick dip is out of the question. Each flight was different landing at 'Round bush', 'Happy tree' and the airstrip. In a landscape with so few landmarks every tree and bush takes on a name. 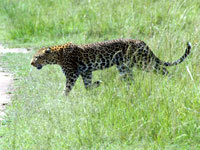 On our return from our first flight we took a game drive and were astounded by the animals we saw. 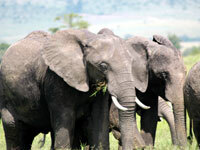 These elephants were in a small herd with a large bull elephant keeping a distance. 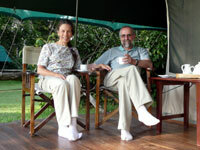 We followed the bull elephant along a track and through a stream keeping a respectable distance. 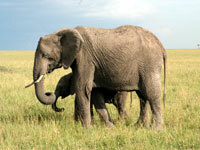 The mother elephants always put themselves between the land rover and their young so its difficult to get a good photo. All the elephants we saw appeared relaxed and happy without a care in the world and when you see how they behave around lions you know why - they are masters of their environment. 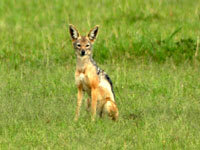 We were fortunate enough to come across a family of jackals. They look really cute and the youngsters were curious enough to come running over to the vehicle. They are nocturnal so we were lucky to see them out in the open. Many people spend years working in the Masai Mara without ever seeing a leopard so you can imagine how surprised we were to come across this chap just walking across the track in front of us. As with most of the animals he ignored us as he went about his business. 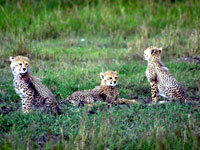 The BBC Big Cat Live programme has a lot to answer for and these three cheetahs were stars of the show. Our guide Fred took us to them late one afternoon and we watched in wonderment as they played around their mother or chased each other around bushes and hiding in hollows. 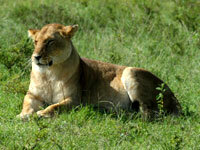 This is Shakira, mother of the three cubs and star of Big Cat Live. As we sat watching she didn't stop scanning the horizon for prey or predators. We could have watched her for hours but the sky was looking threatening and shortly after driving away the rain started and Fred put the plastic sides down on the Land Rover to keep us dry. 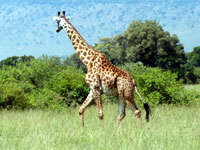 Giraffes have to be the weirdest creatures on earth. Having said that they are majestic and really beautiful in there movements. We saw several giraffe across the plains and on one occasion we saw about ten all in the same area and two females were apparently fighting each other using their necks as weapons for the attention of a male. 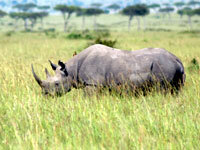 We were so lucky to see Black Rhino and we saw this one and a youngster twice. These are creatures that you wouldn't mess with, with such a sharp horn on the front end of several tons of bulk. Our week was magical in so many ways. 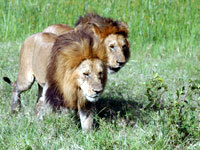 we not only watched these male lions we also saw them have a fight with one of the females and they came off worse. 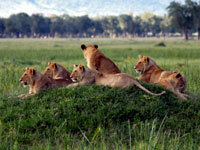 The cubs jumped all over their fathers until the male lions got up and walked off in disgust. All of this is taking place a few metres away from where we're sitting. The suggestion that the lion is the king of the jungle is incorrect - it's the lioness that is the queen of the Masai Mara. There were three females and they certainly ruled the pride, sufficiently for the males to feel very uneasy when they were close by. In this pride there were nine cubs. They spent a great deal of time sleeping but they also played with each other as part of their training to stalk and kill later in life. We sat and watched the pride for some time. To call it exciting would be a gross understatement. 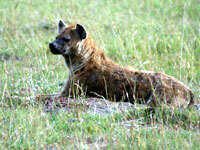 Hyenas are evil looking and their looks epitomise the way they live. Our driver Fred told us a story of how he'd seen a Hyena that was annoying a lion get swiped by the lion so badly that the hyena's intestines were falling out and as the hyena ran away it realised there was this meat hanging out from itself and started to feast on its own intestines until it died. Baboons are so common that we soon started to ignore them however they would soon make themselves known if you happened to leave the tent open. 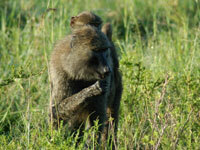 The Askari (guards) keep the baboons at bay and will throw sticks at them whenever they become too inquisitive. 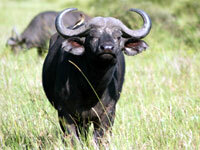 The Cape Buffalo does not look particularly threatening but the stories we were told belie its looks. Firstly they have this stare that looks directly at you and it seems as if they're are weighing up whether to attack or not. We were told they don't have a reverse gear so that once they start a charge they will just keep running and although they may become prey to lions they will often retaliate and inflict serious wounds. "Patience my arse I'm going to kill something" Of course vultures don't kill things but they look large enough and ugly enough. We saw several varieties of vulture and on one occasion found a flock hopping around the carcase of a hyena with their heads deep inside the stomach cavity - fascinating but not before breakfast. This is a raptor, a bird of prey. 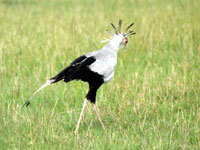 The secretary bird is very beautiful with the strange quill feathers sticking up around its head. 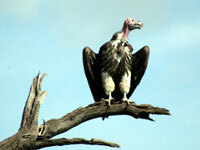 We never saw one in flight but we were assured that they fly into trees to roost at night. 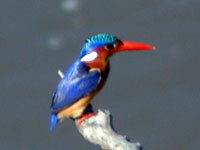 We saw a number of different kingfishers on our travels. The Malachite is particularly beautiful and we spotted this one within 25 metres of Dave & Lucie's home. 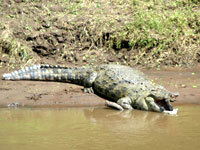 It sat out on a branch frequently diving into the Mara river to catch small fish. Prehistoric, aptly describes the crocodile. We rarely saw one moving and this chap had recently eaten judging by the size of its stomach. Apparently a crocodile can go 90 days between meals. 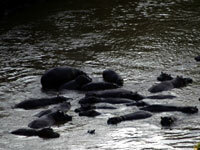 Hippos are nocturnal so it was difficult to get a good shot because we saw them either first thing in the morning or at dusk. We watched a family one evening and the most fascinating element is the noises they make. 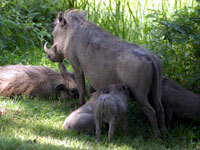 Having seen so many exotic animals we became rather blasé about the warthogs that were around the camp. This family group were taken whilst we were eating lunch. Interestingly they get down onto their front knees to eat grass. So at the end of a week we had undoubtedly had the most magnificent holiday of our lives. This was made all the more special because Africa was a country we had no desire to visit and we were of the opinion that if you wanted to see wild animals then go to a zoo and you can see them close up - how wrong could we be? 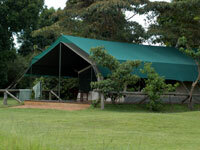 Our accommodation was excellent, we could, if we didn't have the will power, eat three cooked meals a day and someone to bring us tea and biscuits every morning whether we were going ballooning at 04:45 or on a game drive at 05:45. This was a life fit for kings and queens and we loved it. And of course we haven't mentioned that every day someone would clean our room, make the bed, take away the dirty washing, return it cleaned and ironed and finally a hot water bottle in the bed every night.